Review posted October 15, 2017. Candlewick Press, 2017. 74 pages. 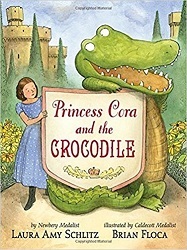 I am quite sure Princess Cora and the Crocodile is going to be one of my favorite books of the year. It’s a nice twist on your typical fairy tale scenario. This is a simply told beginning chapter book with abundant illustrations on each page – but the story is worth reading not only for beginners, but also for people who have been reading for years, and also for people who aren’t able to read yet. I like Princess Cora – she’s just trying to do what’s right and follow the rules. Brian Floca portrays her as a good girl. But oh, the spark of mischief in the crocodile’s eyes when things start happening! Here’s the scenario: The King and Queen love Princess Cora from the day she’s born. But then they realize that she will be Queen some day. They must teach her! They must train her! By the time Cora is seven years old, she’s being trained every minute. Her nanny makes sure she’s always tidy and makes Cora take a bath – and wash herself thoroughly – three times a day. The Queen teaches Cora that a princess must be wise. Every day she takes Cora to the tower room to read books about how to run the kingdom. The King is in charge of her physical training. He’s turned the old castle prison into a gym and has Cora run in circles and skip rope up to five hundred. A future queen must be strong! These thoughts scared her, but she couldn’t stop thinking them. When she presents this idea to the nanny, the Queen, and the King, they are not in favor. So that night she writes a letter to her fairy godmother, saying how much she wants a pet. Savvy readers will realize she should have been more specific. The next morning, there’s a box at the foot of her bed, with a crocodile inside! And he’s a crocodile with an attitude. As they talk over how the crocodile can help, they decide that he will take her place and give Princess Cora a day off. He puts on one of her dresses and yarn from the mop as a wig. No one had ever told Princess Cora to run along and have fun, and she almost didn’t know how. But she dressed herself in the flash of an eye and ran down the castle steps and out the back door. Am I her favorite croc? You bet! Meanwhile, Princess Cora is having a lovely time in the woods. I love the way Brian Floca draws her, getting gradually dirtier, with a scrape on her elbow, but clearly having a wonderful time. And yes, everything comes right in the end, and the process of this happening is beautiful. And it’s all done in simple language for kids ready for chapter books, in seven chapters, with marvelous illustrations on each page.